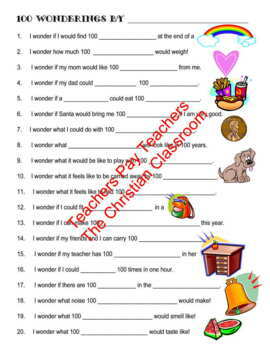 Have your students use their imaginations with this worksheet. Students are guided through 20 fill in questions where they are asked to create statements containing the number 100. Sometimes they come up with literal statements and sometimes they take a funny approach. Have students share their statements with their classmates for extra reading and presentation practice. Please share and comment if find this resource helpful, it would be greatly appreciated!